Suan Rak Park is located on the Western edge of the old town of Nakhon Ratchasima, a city which is known locally by it old name of Khorat. 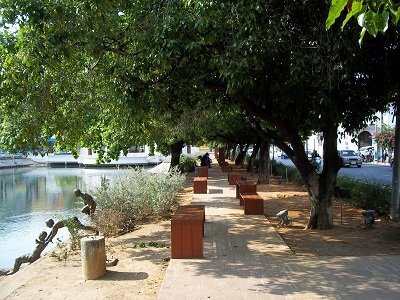 Suan Rak Park is by daytime the municipal heart of the city and the site of the city’s most important monuments. By night time the park becomes the city’s red light district, which in some ways is appropriate as Suan Rak means ‘love park’ although we doubt that this is what the local council had it mind when it named the park. The most important of the monuments in Suan Rak park is the Ya Mo (Grandmother Mo) statute. Ya Mo was ennobled by the Thai Royal and became Lady Mo after, as the legend goes, she organised the successful defence of Nakhon Ratchasima against an invading army from Laos. In 1862 the Vientiane King decided to invade Northern Thailand in an attempt to gain freedom from Thailand, and King Rama III. 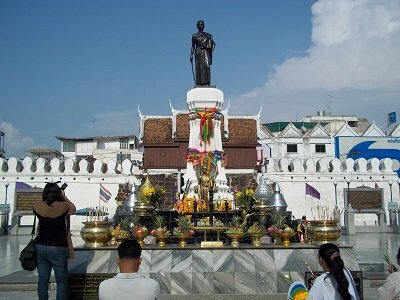 The Laotian Army was comprehensively defected and Lady Mo acquired a status not dissimilar to Joan of Arc in France and the Ya Mo statute has become a shrine with many Thai people coming to worship here year round. 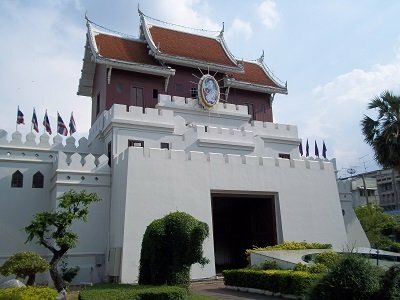 Located at the North end of the park is the Thai Suanari Museum. The museum is modelled on the style of the city’s original built in the 1600s. Inside the museum are artefacts and displays dedicated to Lady Mo. Of particular note is the wall mural, and the diorama, showing the story. The park is also full of statues. Most impressive of this is next the Ya Mo shrine. 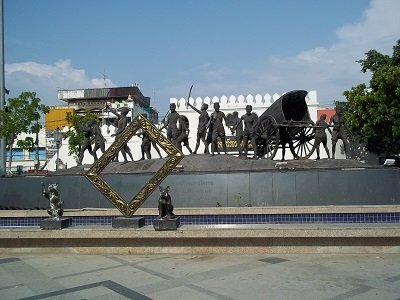 In depicts the group of Thai city dwellers who (according to legend) rose up to defeat the Laotian Army who had taken control of the city. The figures depicted are not dressed as soldiers, but normal people armed with kitchen knives and agricultural implements. The playful statutes are dotted all around the park. This one depicts local boys swimming in the park’s small lakes. To the left of this picture, out of shot, there was one teenage boy sat half submerged in the water with his disapproving girlfriend sat on a park bench on her mobile telephone. I am not sure she was feeling the love in Nakhon Ratchasima’s Park of Love. 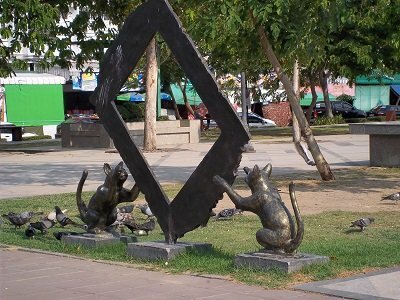 The famous Khorat cat breed, known in Europe as the ‘Siamese Blue’, is also represented in a number of the statues. The Khorat cat is one of the world’s oldest breeds of cat. As well being popular amongst American and UK breeders, the cats are traditionally seen as bringers of good luck by the people of Nakhon Ratchasima.